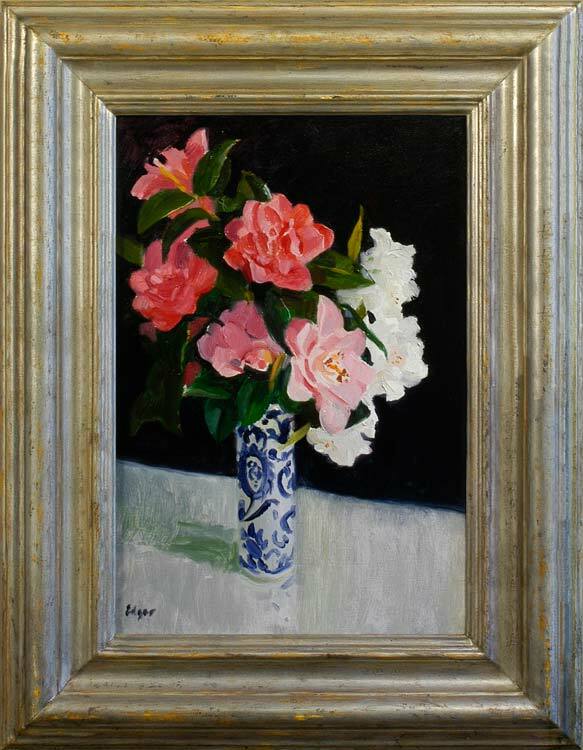 Edgar’s style is spontaneous, simplified and painterly in this study of camellias, although his larger set pieces tend to be more finished, complex arrangements of bouquets, fruit and drapery. His work is in the tradition both of late 19th century flower painters such as Fantin Latour and Manet, and of the Scottish Colourists. He paints with pure colour, sensitive to the nuances of reflected and refracted hues, but is not afraid to use the glossy blacks Manet employed, as in the background of this vibrant and powerful image.